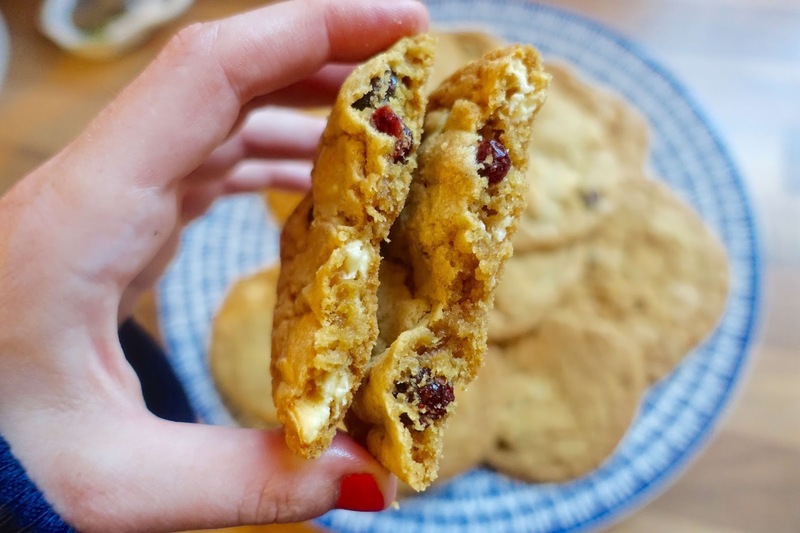 One of my favourite cookie variations is white chocolate and cranberry - two of my favourite ingredients crammed into a giant cookie, with creamy chunks of white chocolate and bright zesty cranberries packing a punch of flavour, its a winning flavour combination! 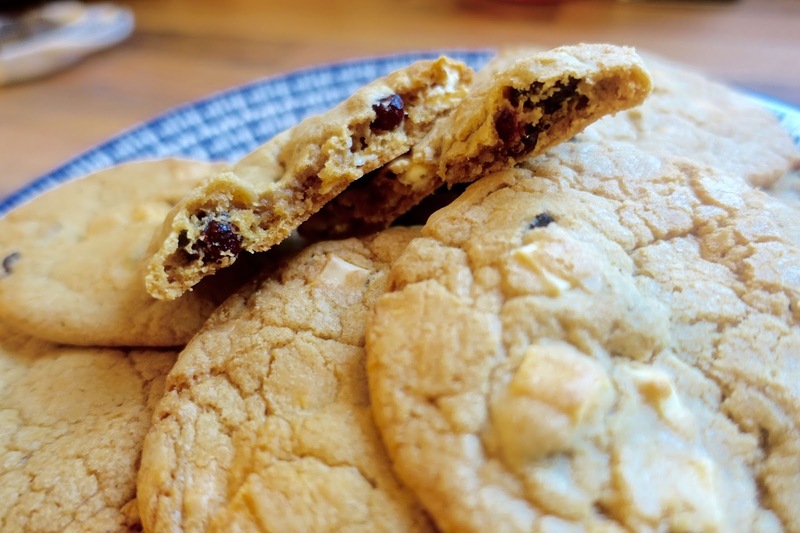 Overloaded with chunky white chocolate chips and tangy cranberries - these ultra soft, giant cookies are the perfect bake for any time of the year. I took half into work the next day and they disappeared very quickly! The most important aspect of baking cookies is the baking time if you really want that ultra-soft, chewy cookie middle like you buy from your local bakery. 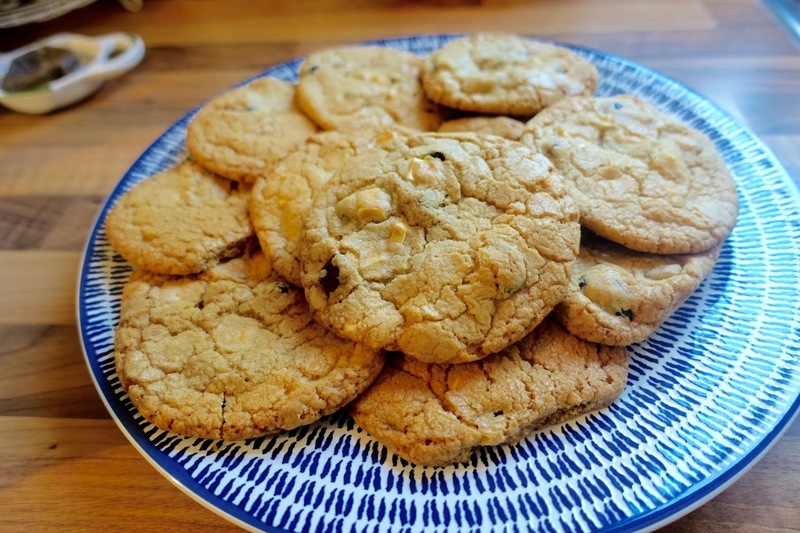 It's important that you watch the cookies closely while in the oven - to be honest, I didn't even leave the kitchen, it's a good time to do the bits you loathe - like wash up while you wait (believe me you'll thank me later). You'll want to take the cookies out of the oven at around 10 minutes - bearing in mind they will appear soft and underdone in the centres, but once out of the oven these will firm up as they set and cool. Of course, if you prefer your cookies a little less soft, cook for a further 5 minutes until your happy with their consistency. So how do you make these delicious giant white chocolate and cranberry cookies? Preheat the oven to 170 degrees / 325F / Gas mark 3, and line two baking trays with baking parchment paper (same as greaseproof paper). Using a hand-held electric whisk or mixer with paddle attachment, cream together the butter, both white and brown sugar, then break in the egg, add the vanilla essence and mix well together. Sift together the flour, salt, cinnamon and bicarbonate of soda, then add to the already creamed mixture in two batches - mixing thoroughly in the mixer (or by hand) until a dough starts to form. This is where you can add your fillings - for my cookies I choose to include chunky cranberries and white chocolate chips so at this stage you still your fillings into your dough ball mixture. Break off pieces of the dough (about 2 or 3 tablespoons in size, depending on big or small you want your cookies to be) and roll them into balls, bearing in mind this can be a little a messy but time to get your hands dirty and place on the prepared baking trays. Allow five or six cookies per tray, again this will depend on how big you want your cookies to be, and make sure to space them apart from each other (by about 7-8cm / about 3in) as they will spread during cooking. Place in the oven and bake for 10-15 minutes or until the cookies are a light golden on top. 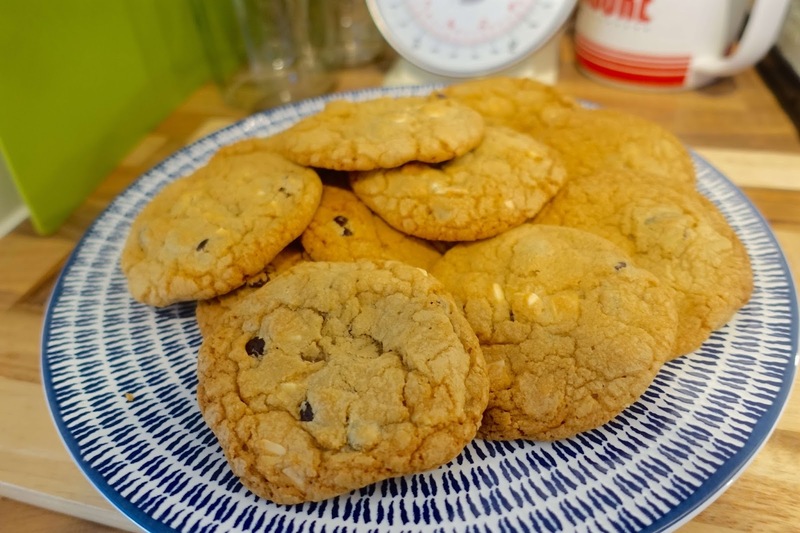 The key with baking your cookies is if you want a gooey middle you'll need to take out the cookies while they still feel soft and squidgy, don't worry - once you leave them to cool they will firm up and you won't regret taking them out a minute or two early! Once out of the oven, leave on the baking trays for about 10 minutes to cool and set, before transferring over to a wire rack. Then you can enjoy with a lovely cup of tea - perfect! Still in the mood to bake? Why not try this ginger and orange cake with mascarpone icing recipe? I love cranberries and cookies. Perfect combination right there!! My cooking skills are a little better than a 5 year-old but I should definitely try this one!